Many homeowners try to get the most out of their garage which makes total sense. After all, these are totally versatile spaces - you can use the space to park your vehicle, store personal property, use your garage as a workshop, and even convert it to an area for social gatherings and lounging. If you plan to do more with your garage than simply store your car, it's possible that you'll want to relax in the area during the hot summer months. You'll get a natural breeze, but leaving the door up will let the flies in. This is when a garage door screen comes in useful - read on to learn more! 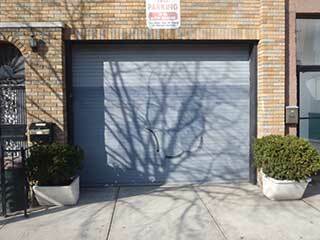 If you are considering adding a screen to your overhead garage door, the first step is to take proper measurements. Measure from left to right and top to bottom of the garage door opening; this should include length, height, and width - you may wish to do this more than once to ensure that the measurements are as accurate as possible. Once you have obtained accurate measurements of the garage door opening, you can start shopping for a screen based on those specific measurements. You should be able to find them at various hardware centers as well as online retailers. The prices may vary. Typically they are seven to eight feet in width which should usually be sufficient -you will also want to opt for a retractable option so you can easily lift and lower the screen. While in the process of buying your screen, keep in mind that you'll also need a few additional pieces to help you fasten it. This might depend on the type of screen you go for but usually, these parts consist of adhesive hooks and sewing loop fastener material. This should be available in online or hardware centers as well. After you have successfully acquired all the right equipment, it's time to install! Based on the measurements that you have previously taken, cut the screen to fit the dimensions of the garage opening. Use a cutting tool that provides accuracy such as a box cutter or some other type of sharp edge razor. Attach the adhesive hook fastener material to the exterior of the garage door frame and assemble the screen against the hook fastener. Hey presto! You've got your screen! Additional questions regarding sourcing and installing a screen for your garage door? Just contact our professionals at Garage Door Repair Laveen - our team would love to hear from you.